What’s better than a simple, delicious dish for dinner? Two simple, delicious dishes! 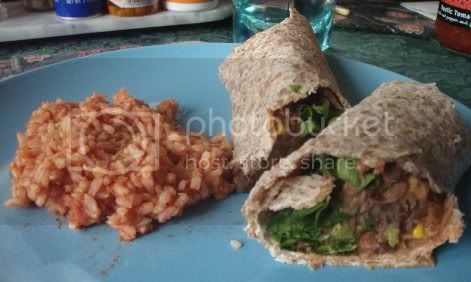 I had some black beans left over from making a bean and rice dish last week, and the idea of black bean and corn burritos struck my fancy when I was searching for something to do with them. I went with a truly simple 1,000 Vegan Reicpes concoction of black beans, corn kernels, onion, and salsa. Making it was just as easy as it sounds! I added some chopped spinach and fresh cilantro for garnish, and that really brought everything together. The salsa gave the mashed beans flavor and moisture, and the corn added a surprisingly firm texture. I usually get quite fancy with black beans, throwing in everything from cumin to lime juice, but this was perfect as it was. For an accompaniment, I pulled out the Happy Herbivore Cookbook to find the red rice recipe I knew was in there. Do you ever find yourself thinking more about a picture of a recipe than the recipe itself? Yeah, this was one of those times. Turns out the picture stuck in my head was of Charleston Red Rice. Again, a simple recipe that basically involves turning brown rice into a pile of seasoned, tomato-y goodness. Cayenne and hot sauce are involved, so of course the hot food lover in me had to have it. 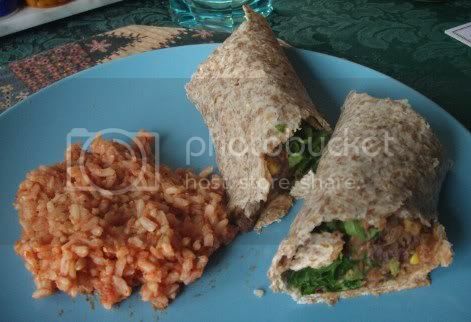 It made a great side to the burritos, and I think it could be a meal in and of itself with the addition of some beans and a few veggies. Once again, a simple dinner turned out to be amazing!